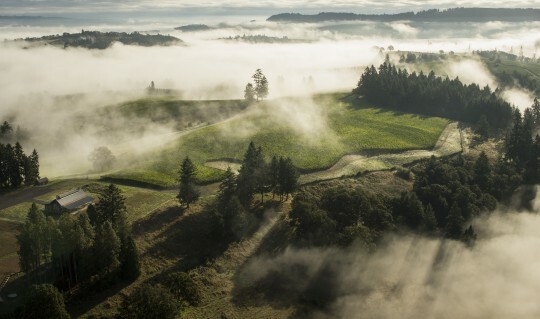 Patricia Green Cellars is located in the Ribbon Ridge district of Yamhill County on the 52 acre estate purchased in 2000 by Patty Green and Jim Anderson. The winery, and thus the two friends, are noted for producing a tremendously broad selection of Pinot Noirs from far flung vineyards representing some of the better sites in the Ribbon Ridge, Dundee Hills, Chehalem Mountains, and the Eola Hills growing regions. All of the vineyards we either maintain or purchase fruit from are extremely well-tended sites that seek to grow the best fruit possible through rigorous attention to detail on every single vine. To ensure that our sites truly show the characteristics of the soil, micro-climate and clonal material none of them use irrigation. We have cobbled together over the years a collection of vineyard sites, whole and in part, that we feel represent some of the better sites from the best appellations in the state. The crowning jewel was landing what is now our Estate Vineyard. On top of that though we have other sites that are almost exclusively between 15-35 years in vine age. While old vines won’t necessarily mean that the wine is better than wine from younger vines the likelihood that a well managed and well situated site will produce better wine from its older vines than its younger ones is extremely high. We are fortunate to have this large cache of older vines, many of which we have worked with for an extended period of time which is also extremely important as it gives you knowledge of the site, how it ripens, when it ripens, what flavor characteristics one should expect, how the wine ferments, what barrels best match the wine and so on. We chose these sites because we felt they were unique, compelling and produced excellent fruit. In the winery the philosophy of attention to the smallest details is further extended all the way from the fermenting must to the final bottling process. At a larger level the philosophy of the winery is fairly simple: Do what needs to be done. We feel that you simply cannot enter into a vintage with pre-conceived notions of what is going to happen, what our fruit is going to be like, what our wines are going to be like and what we are going to need to do to turn our fruit into the best wines possible. There are certain approaches and techinques that we will obviously look to apply (for instance, sorting fruit, cold soaking must, punching down, etc. are all things that are going to happen) however we consider the intensity of those actions as fluid. That fluid nature would extend to nearly every aspect of our winemaking. Our winery, the equipment within and the people that work for us are our tools for making the best wine we can. We apply those tools as liberally or as conservatively as we think best suits the situation with which we are presented. Ultimately we try to do things simply. The 14th century friar William of Ockham stated that “one should not increase, beyond what is necessary, the number of entities required to explain anything.” This is the physics theory known as Occam’s Razor. It applies to winemaking though, too. With a combined 42 years worth of winemaking experience we have come to realize that the hardest thing to do is to do the simplest things. Again, this does not mean we do not take action when necessary, it means that we do what needs to be done.